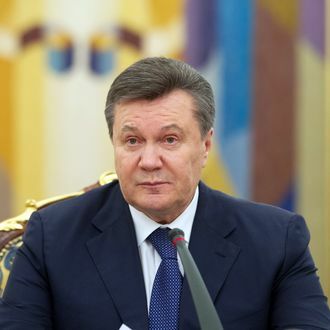 Just days after signing a peace deal with protesters, on Monday, Ukrainian President Viktor Yanukovych was on the run as the new government issued an arrest warrant for his role in the death of 88 people in last week’s demonstrations. “As of this morning, a criminal case has been opened based on the mass murder of civilians,” Ukraine’s acting interior minister, Arsen Avakov, wrote on Facebook. “Yanukovych and some other officials have been put on the wanted persons list.” Yanukovych has not been seen since he denounced his removal from power as a coup on Saturday, and it seems interim leaders are trying to enlist the public’s help in preventing him from leaving the country. Yanukovych’s flight from Kiev was “an escape odyssey worthy of James Bond,” as the New York Times put it. Yanukovych abandoned his official residences on Friday, allowing the public to roam through his lavish home and private zoo. He then headed to his home town of Donetsk by helicopter and attempted to leave the country on a private plane, but was thwarted by border control. After switching to car travel, he hid out in a private sanatorium in Crimea, and a private residence near the port of Balaklava. He allowed his security officials to leave if they wanted, then set out again with the remaining guards. There are rumors that he might have fled on a Russian ship, but on Monday his whereabouts were unknown. The U.S. and E.U. have offered to financially assist the new interim government, which may be formed Tuesday. Ukrainian officials warn that the country is on the verge of bankruptcy, and the International Monetary Fund is said to be considering an aid package of up to $15 billion.